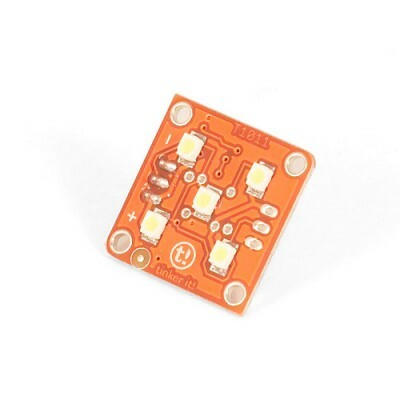 The Power LED is an actuator. Five ultra-bright LEDs can be powered from an Arduino pin. Input: Arduino provides a maximum of 40 mA per pin, enough to light up the five LEDs using the DigitalWrite() and AnalogWrite() functions. Module description: This module features Five AWT801-S LEDs from Seoul Semi Conductor, the standard TinkerKit 3pin connector and a green LED that signals that the module is correctly powered and a yellow LED that is lit only when the LED is lit. A resistor limits the voltage from the Arduino, protecting the lights. This module is an ACTUATOR. The connector is an INPUT which must be connected to an OUTPUT connector on the TinkerKit Shield.